Distracted driving is a serious problem in Brampton as it is in all of Ontario. Using a cell phone while driving, whether to send text messages, or make and receive phone calls, will cause a driver to take their focus off the road for the critical seconds it takes to swerve into oncoming traffic or lose control and go off the road entirely. Travelling at 60 km/hr, if a person takes their eyes off the road for only 3 seconds, they will have travelled more than 40 meters, effectively losing that much braking distance. The following illustrates just how hazardous distracted driving in Brampton has become and as Brampton personal injury lawyers, we're here to help innocent victims of drivers who have been careless. According to the Virginia Tech Transportation Institute, the most common distraction for drivers is sending and receiving text messages on their smart phones. Drivers are 20 times more likely to be involved in an automobile accident while texting than are drivers who are paying attention exclusively to the highway. People who are at the highest risk of having a distracted driving accident are young people age 16 to 20. Of all drivers in this age group, some 80% admit to texting while driving. Distracted driving crashes cause more deaths per year than impaired driving according to Ontario Provincial Police (OPP) sources, and their numbers are rising. In Canada over the most recent five-year period, distracted driving fatalities rose from 302 deaths to 352. (Source: Canadian National Collision Database). The legal implications of distracted driving in Ontario vary, ranging from fines of up to $2000 to a suspension of one's driver's license to driver rehabilitation requirements. In some cases, a person can be charged with dangerous driving and face jail time. A 52-year old women was recently killed while attempting to board a municipal bus by the driver of a service van. Vicente Bacobe Arbis was charged with criminal negligence causing death, as well as a number of other charges, after his vehicle plowed into the bus killing Ranjana Kanagasabapathy and sending 12 people to the hospital. According to sources, eyewitnesses at the scene say they saw Arbis talking on his cell phone at the time of the accident. Distracted driving in Brampton is an egregious offense on par with that of driving under the influence, yet many drivers appear to be in denial of its potential catastrophic outcome. Many Canadians believe it's time our lawmakers moved into the 21st-century and treat distracted driving incidents more seriously by increasing the penalties on offenders. If you have been injured or have had a loved one killed in an automobile accident and suspect negligence, we are here to help you obtain fair compensation and justice from the 'at fault' party and their insurance company. Time is of the essence when an accident involving negligence has occurred. 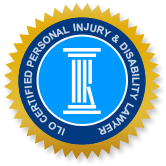 Your ILO personal injury attorney needs to immediately gather evidence such as cell phone records, police reports and DUI test results to assemble a case on your behalf. We need to send the message that it is not okay to use cell phones while driving. Without serious ramifications to distracted drivers who put others at risk, as well as an aggressive education campaign detailing the hazards of cell phone usage while driving, many Canadians will continue to use them and the death toll from the automobile accidents they cause will continue to rise. Concerned Canadians are encouraged to voice their opinion to their government representative. For anyone who has been seriously injured by a distracted driver or any other type of accident, the Injury Lawyers of Ontario (ILO) law team serving Brampton would like you to get the compensation you deserve.